Release Date:04/01/2016;Notes:Limited vinyl LP reissue containing four never before released Storm Thorgerson album art sketches. 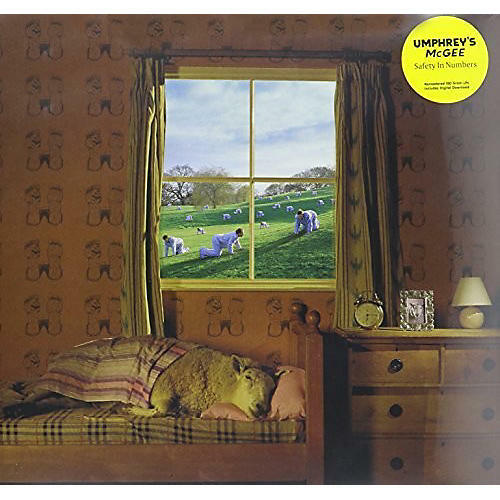 Safety In Numbers is Umphrey's McGee's fourth studio album, released on April 4, 2006. Huey Lewis and Joshua Redman both make appearances. The album contains many slower, acoustic songs and a simpler, stripped down approach with little jamming or progressive rock elements. The artwork for the album was done by Storm Thorgerson. Umphrey's McGee is an American progressive rock band originally from South Bend, Indiana. Although the band is part of the jam band scene, like Phish and the Grateful Dead (with ever-changing setlists, improvisation, two sets per night, open taping policy, etc. ), they are much more influenced musically by progressive rock artists such as King Crimson, Yes, Pink Floyd, Frank Zappa, The Mahavishnu Orchestra, and early Genesis, as well as heavy metal bands such as Iron Maiden and Guns N' Roses.